Another Scoble in the works! I see Maryam and Robert Scoble are announcing that they are expecting a baby sometime this September. Great news guys – sincere congrats. I have had issues with Google Reader (Google’s online RSS/feed reader) in the past but in the latest update to Google Reader, released today most of those issues have been addressed. Lots of people are posting opinions on this from Marshall Kirkpatrick on TechCrunch to Robert Scoble on Scobleizer to Richard McManus on the ReadWrite Web and all the reviews are effusive in their praise! I’m not surprised. This time Google seem to have got it right. 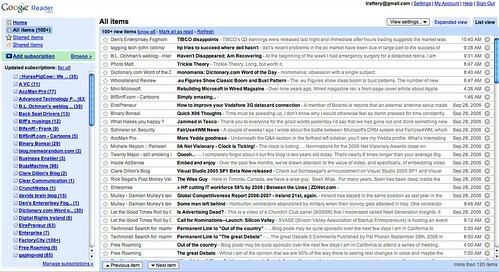 The old “Lens” look of the old Google Reader was, to my mind, sacrificing usability for looks. Now, you have a reader with a simple, fast interface not lacking in functionality. It even has a river of news option with an infinite scroll. And if you liked the old interface you can revert to that in the settings page too! Added functionality includes the ability to create folders, bulk delete subscriptions, star, share, email and tag posts. Several commentators have pointed to the continuing lack of integration with Google’s Blogsearch but personally with the dire state that is in, I think this is a good thing! I have been slow to recommend online rss readers in the past but I think with the new Google Reader that has just changed. Apple has yet again sent in the lawyers – this seems to be a favourite tactic of theirs which is increasingly giving them a bad name (and I am a Mac fan!). This time, Apple have gone after a company called Podcast Ready for their use of the word Podcast and myPodder (their product name). Robert Scoble has suggested using the terms Audiocast and Videocast from now on and dumping the term podcast – however this doesn’t solve the problem for Podcast Ready (nor any potential problems Robert’s company PodTech nor my podcast/audiocast site PodLeaders might yet have). Apple have already gone after several companies for their use of Pod in product names. we have Apple, maker of the iPod, trying to get right with the Trademark office about achieving formal Trademark and related mark protections for iPod AND its sought-after IPODCAST applications. Russel is probably close to the mark here – however, Apple’s over-vigilence is doing nothing but tarnishing their image. I finally got around to putting up the talks from the IT@Cork Web 2.0 Conference! Shel Israel led off the talks at the IT@Cork Web 2.0 conference with a great introduction to blogs and social media – drawing very much on his experience co-authoring a book on business blogging called Naked Conversations called Naked Conversations with Robert Scoble. Shel’s talk is here. Salim Ismail was next up. Salim was a powerhouse of knowledge and ideas. His talk concentrated on uses for Web 2.0 technologies in the enterprise and if you ever want to see a room full of jaws drop simultaneously, go to hear Salim give a talk. He is an extremely accomplished communicator, deftly making the most complex of ideas readily accessible. Salim’s talk is here. Third up was Fergus Burns who spoke knowledgeably on the topic close to everyoneâ€™s heart – starting a Web 2.0 business in Ireland! Fergus’ talk is here. Walter Higgins was the fourth speaker up. Walter has a Web 2.0 application called pxn8. Pxn8 is an online photo editing application. Walter showed how pxn8 has been developed using free development environments. Walter’s talk is here. Finally Rob Burke from Microsoft Ireland gave us a demo we are not likely to forget for a long time – he live developed a web 2.0 app using Atlas on a laptop running Office 12 beta and Vista beta! And it didn’t crash once. The demo Gods were really smiling on him that day! Rob’s demo is here and is followed by the question and answer session between the panel and the audience. Om Malik announced today he is leaving his job at Business 2.0 to setup a new business. Robert Scoble let slip that he is leaving Microsoft to join a startup, at a bloggers dinner the other night. Tara Hunt announced last week that she’s leaving Riya to go out on her own. Ben Metcalf has left the BBC to start something new. Chris Messina posted a couple of months back that he was leaving Flock to go out on his own. I’m sure there are others I have left out. Of course no trend would be complete without its exception – Niall Kennedy announced he was leaving startup Technorati back in February and subsequently joined Microsoft! It seems that all over good people are on the move, primarily from (reasonably) secure jobs into the great unknown that is startupsville! Is there something in the air? I tried to join in on Waxxi’s interactive podcast of a discussion with Robert Scoble and Shel Israel today. I signed up to join in the podcast very early on (long before Mike Arrington blogged about Waxxi). I received my email with instructions on the number to dial and I dialled the number at the appointed time. I had my question ready and, as per instructed on the phone, I pressed the correct combination of keys to let the moderator know I had a question. I waited to be called in with my question. And I waited. And I waited. Remember I was dialling international from Ireland. I waited one hour and fifty minutes to see if I would be called in to ask my question (what can I say, I’m a bit slow on the uptake). I heard other questions being asked from people who emailed in their questions or IM’d them in. I didn’t know who I could IM my question to (there was no mention of IM in the email instructions), so hearing that others were getting in ahead of me didn’t do much for my mood. The podcast ended and I didn’t get to ask my question. I realise that many people had signed up for this podcast but if this format is to be interactive, more interaction needs to happen between the guests on the show (Robert and Shel) and the people who have rung in. Reading out questions emailed or IM’d in is no more interactive than the podcasts I do at PodLeaders.com.